What is it … Duckbutt, Dumbo or Goat? What kind of introduction is this? It seems to me that it’s a nickname for an aircraft, but which one? Without doubt this is a weird nickname, but when you’re a little familiar with this type of aircraft, you would agree with me that it isn’t a strange nickname. Let me try to explain this. 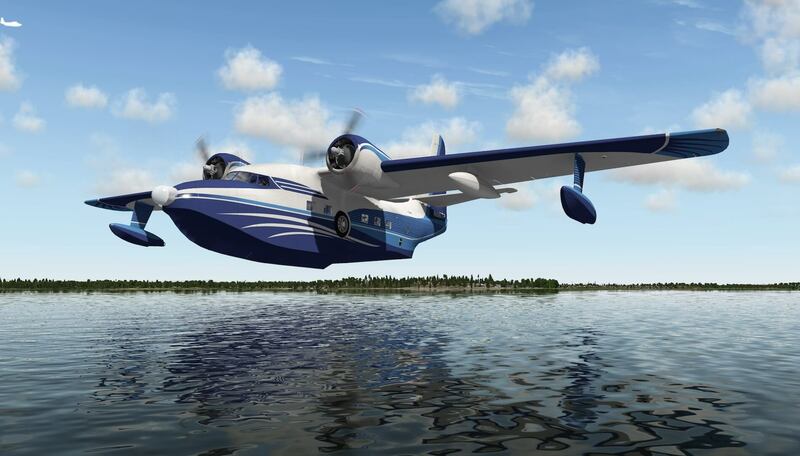 We’re talking here about the Grumman Albatross Hu-16. This model is designed, 3D modeled, painted, handcrafted and what else is worth to mention, by Khamsin and HydroZ.Net. Khamsin is known from his military aircraft like the well modeled and gorgeous looking B17G Flying Fortress and the North American B25J Mitchell. Further on, Khamsin is also responsible for the North American T-28 Trojan, De Havilland DHC-1 Chipmunk and almost forgotten, the Pacific Islands WW2 package. Windows Vista or 7 (32 or 64 bits), MAC OS X or Linux. 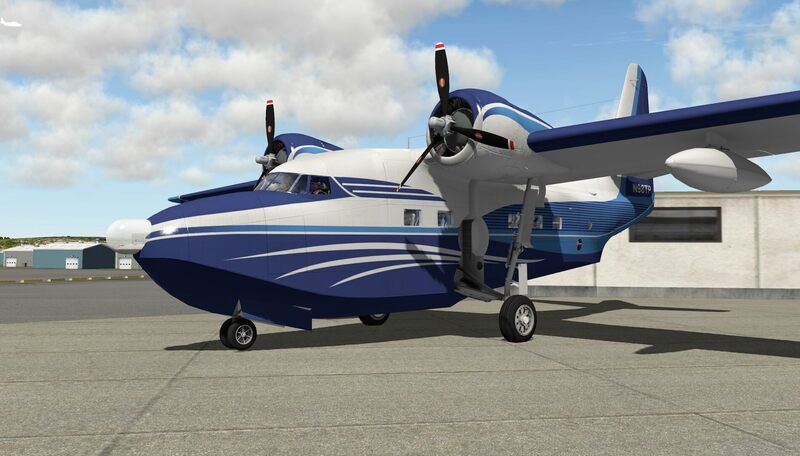 You can buy the aircraft at the dedicated X-Plane.Org web page for 29.95 USD, but the question is, is the Albatross worth it and above all, do you like the aircraft model? Perhaps that’s the even most important question … do you like the Albatross Hu-16? I can tell you already, keeping in mind the overall quality of the Khamsin/Hydroz Albatross, you will not leave this gorgeous modeled aircraft behind you. I think I’ve made you curious and there’s a good reason for that. 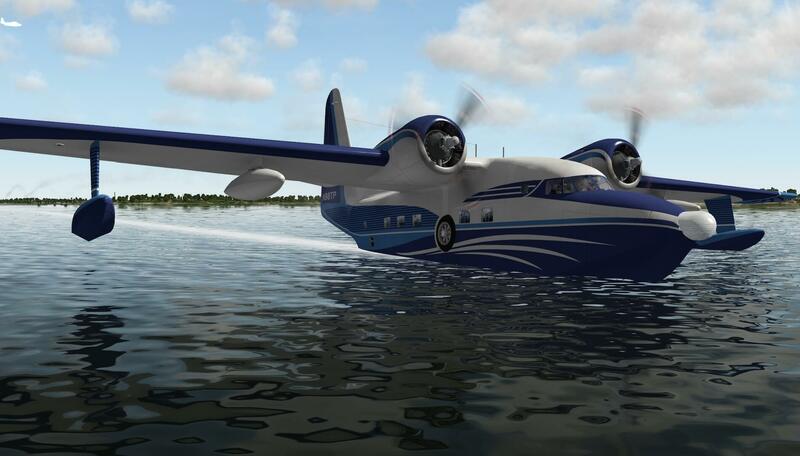 Ready to check out the Duckbutt, Dumbo, Goat or just the Grumman Albatross HU-16? Before visiting the Khamsin/HydroZ Hu-16, it’s perhaps an idea to refresh your memory with some real Grumman Albatross Hu-16 data. 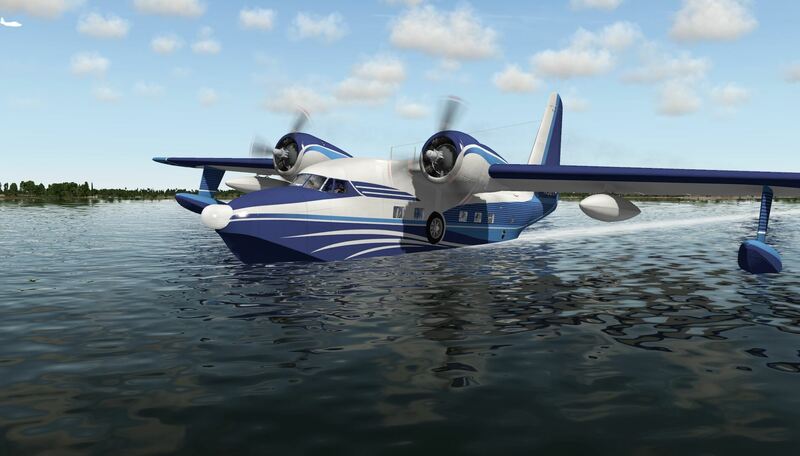 The real Grumman HU-16 Albatross is a large twin–radial engine amphibious flying boat that was used by the U.S. Air Force, the U.S. Navy and the U.S. Coast Guard, primarily as a search and rescue and combat search and rescue aircraft. The Albatross was developed to land in open ocean situations to rescue downed pilots and other flight crewmembers. Its deep-V hull cross-section and substantial length enable it to land in the open sea. The majority of Albatrosses were used by the U.S. Air Force, primarily by the former Air Rescue Service, and initially designated as SA-16. In the mid-1960s the U.S. Department of the Interior bailed 3 military Grumman HU-16’s from the U.S. Navy and established the Trust Territory Airlines in the Pacific to serve the islands of Micronesia. Pan American World Airways and finally Continental Airlines’ Air Micronesia operated the Albatrosses serving Yap, Palau, Chuuk (Truk) and Pohnpei from Guam until 1970, when adequate island runways were built, allowing land operations. 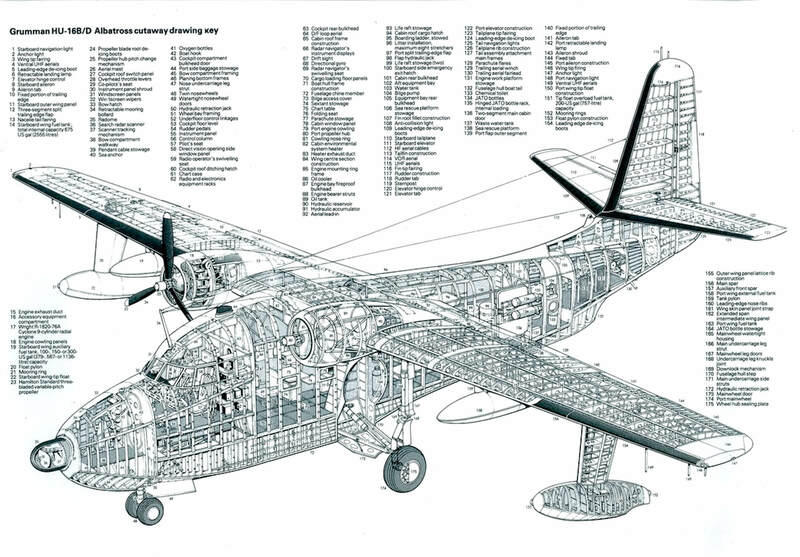 But there’s so much more about the Grumman Albatross on the Internet. I would suggest that you visit the dedicated Wikipedia page but you can also have a look at the Albatross Lady or the Grumman Albatross History Site. Part 1 | External Inspection and ….. hold on! This is very unusual for me. Normally I do my walk-around inspection, a throughout 3D cockpit and virtual cabin check before flying the aircraft, but it seems there’s not much time left to do a thorough check before. The only thing that’s left is a quick pilot walk-around check. But what about the installation, documentation and perhaps X-Plane rendering or control settings? Although some prefer to put this at the end of the review, I keep it at the beginning. Believe me, it won’t take long! Ok, what is what and what is useful? I’ve got the impression, which is good news, that the aircraft description and operation is a mix of own edited and real aircraft information. The pictures included in certain aircraft system descriptions are from the real Albatross. Very interesting, to be honest. Always useful and needed is the checklist which starts at page 37 although later you will see that there’s also an on-screen checklist available. Surprise … when I opened the Khamsin Grumman HU-16 Albatross manual it turned out to be a copy of the previous discussed manual. Therefore no need to explain it again. The provided GMA340 manual is a copy of the real Garmin GMA 430 audio panel manual. 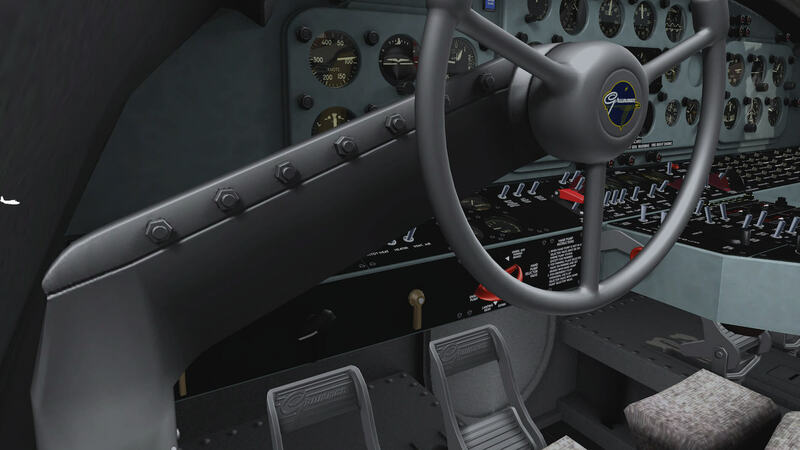 The same applies to the KN-62A – KX-155 – KR-87 manual which covers also the real Bendix/King instruments, although I must inform you that the manual covers some other instruments not used in the Albatross. On page 29 you’ll be informed about the KX 155(A) or VHF communication and navigation transceivers. On page 39 you’ll find the real description and operation of the KN-62A. The instrument is used for DME indication of the selected VOR frequency. And finally, page 41 starts explaining everything about the KR 87 or the ADF system panel. 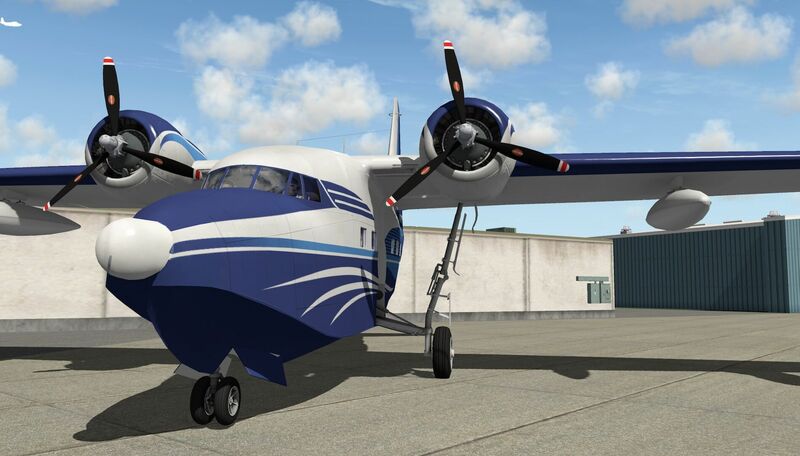 For those who use the Albatross with X-plane 9.70, you’ll find in the Albatross aircraft folder a subfolder named “V9 files”. 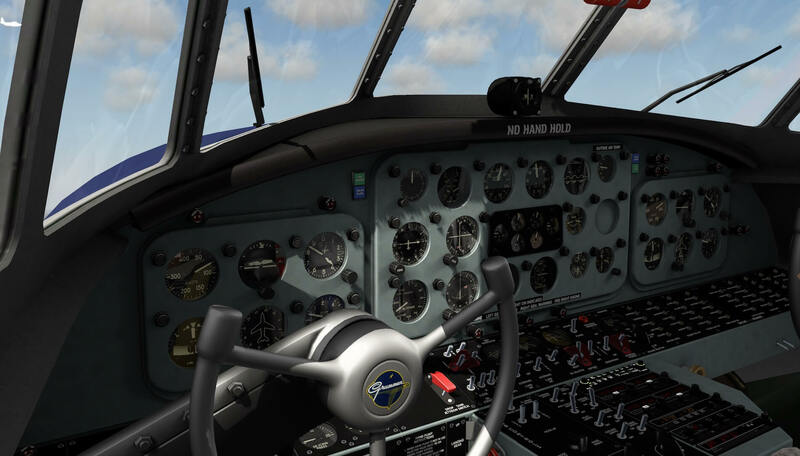 Read the “How to install” text file and you’re ready for your XP9 Albatross. Ok, with that behind me, it’s time to continue with Part 2 | External Inspection and flying. Are you ready too? Part 2 | External Inspection and …. According to the Pilot Flying (PF), I’m allowed to do a quick pilot’s Albatross external check. The problem is that nobody told me what a quick external check is. Therefore, I fill that in myself and do a more regular ground engineer’s walk-around check. Near the Upper Mississippi River and Lake Pepin and not to forget a sightseeing tour around Lake Minnetonka, I’ve parked my Albatross with A/C registration N98TP (a gorgeous livery painted exclusively for X-Plained by Marc Leydecker aka Belga12345) at KRGK (Red Wing Regional Airport). It’s a short walk in the direction of the Albatross. I can tell you already that from a distance and later also during close-up inspections, the modeled Albatross looks gorgeous. Even from a distance, I can see many tiny details which means that a lot of effort has been put into the digital drawing board to create an Albatross that looks as real as it gets. 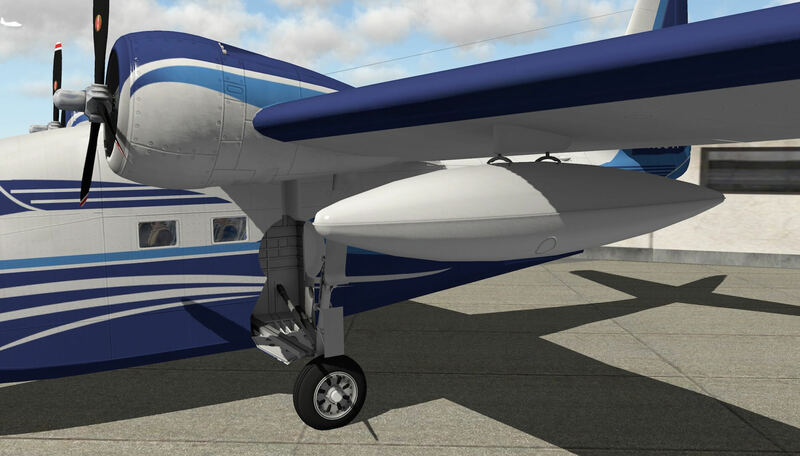 The aircraft comes also with NML (Normal Mapping) files for the slight 3D effect of rivets, screws, skin plates etc. Seeing the Albatross from a distance, I think I now understand why her nickname is Duckbutt, Dumbo or Goat. 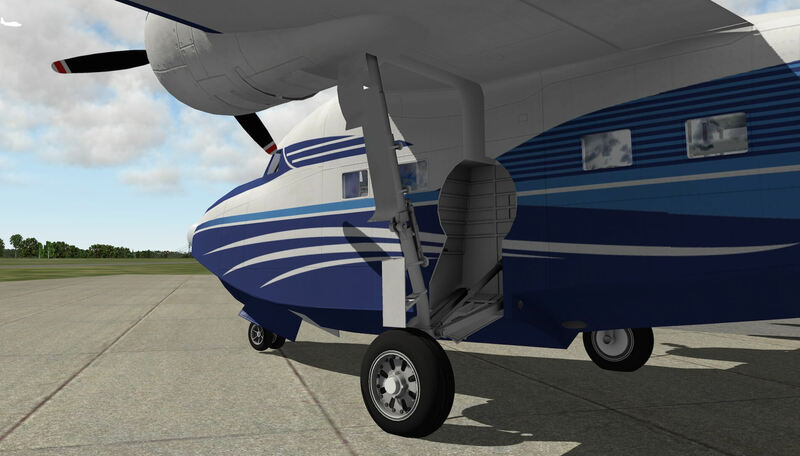 The undercarriage, sorry, landing gear is well modeled and although no real photo material is used, it looks great. 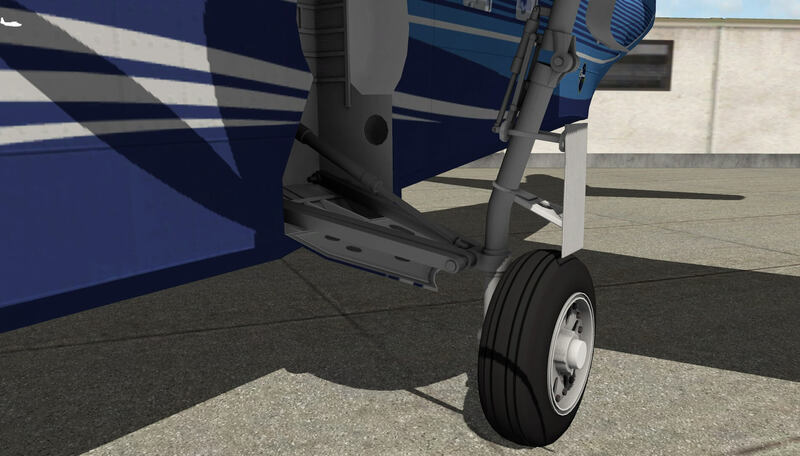 The nose gear strut and nose wheel assembly aren’t really visible from the ground, but the Main Landing Gear (MLG) strut and wheel assembly offer me the possibility to check out this 3D modeling. Another interesting item; with the MLG strut retracted, the fixed strut door closes off everything except the main wheel tire assembly. 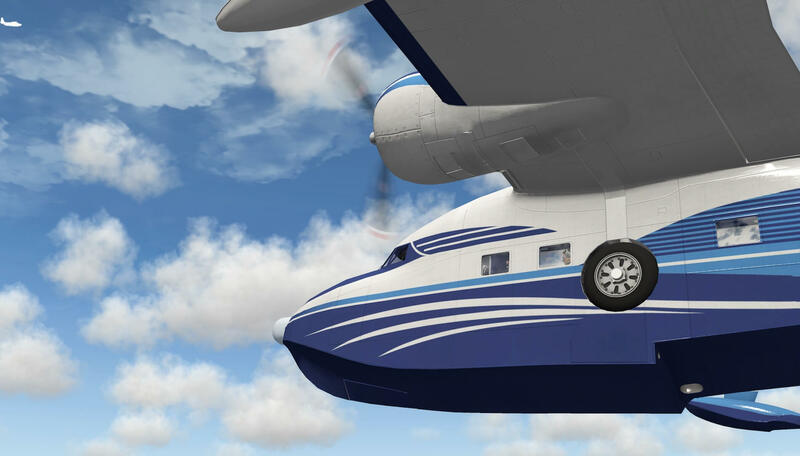 That said, when the gear is retracted, the only thing you see on the side of the fuselage above the water line of the aircraft, is the outboard side of the main wheels. 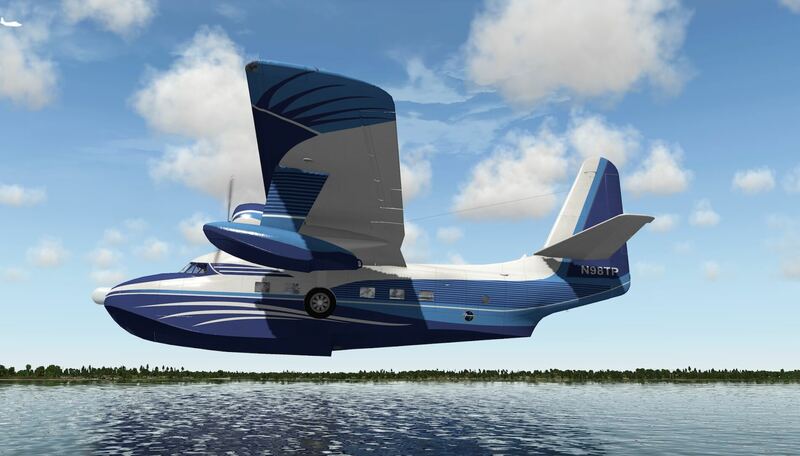 The bottom shape of the Albatross is typical for an amphibious flying boat, sorry, aircraft, sorry, boat … what is it? It’s both and I can tell you, it lands just as easily on water as on solid ground. 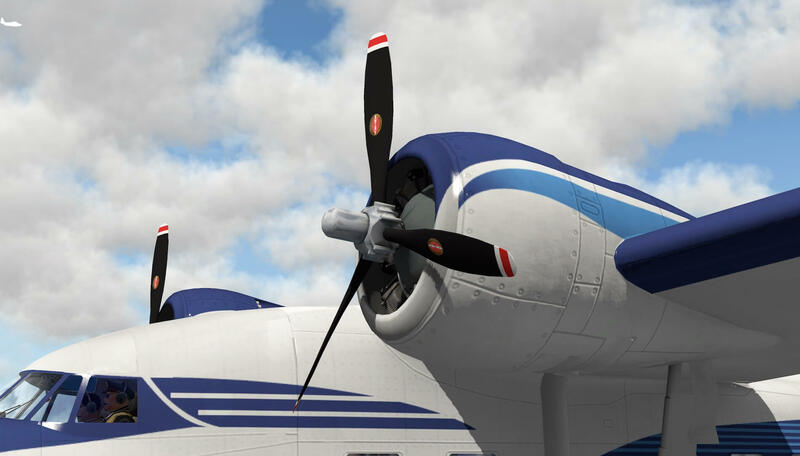 The two radial engines look very nice and real although I prefer there to be a little more weathered look visible or simulated oil leaks or oil drips on the engine cowling. Typical for these old-fashioned radial engines was the oil leakage. No oil leakage means that there’s really a big problem! The wing construction is very simple as well as the flap system, nevertheless it’s a well modeled wing and not to forget the wing end floats. The floats are of course not really needed for a normal runway landing, but only for a water landing. I can’t spot any static dischargers on the trailing edge of the aileron and wing tip. Perhaps the Albatross doesn’t have any static dischargers? I don’t believe that, based on my real aviation experience. 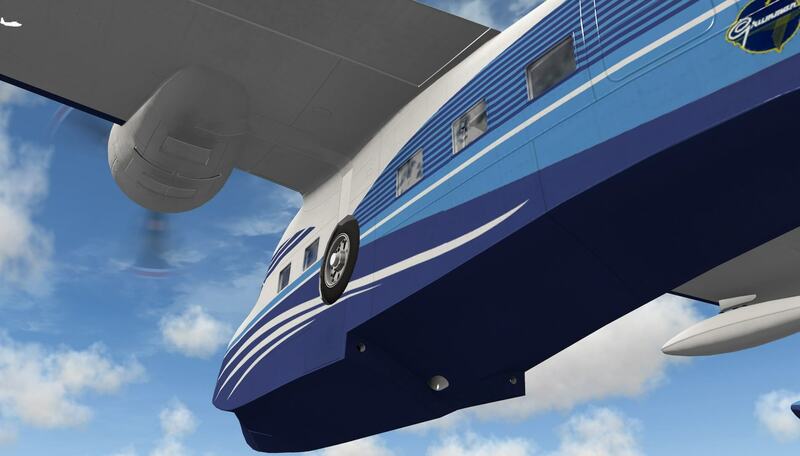 Time to investigate and yes, static dischargers should be mounted on, for example, the trailing edges of the aileron, wing tip, elevators and even on the rudder. The only thing I can’t figure out is the number of static dischargers, but Khamsin knows for sure. While searching for those static dischargers, I found a very nice triple Albatross YouTube movie. You should really check out this YouTube link. I’m not 100 percent sure, but I have the idea some antennas in the front of the fuselage on top of the cockpit aren’t modeled, although I have seen them in the movies. It could be of course that the antennas weren’t available in the old days or not installed on all current flying Albatross aircraft. Anyway, during my wing check I had a close look at the ailerons and then in particular at the way the trim tabs were modeled. Very nice I must say. Via the wing and fuselage, I have a quick look at the tail section. Not easy since the tail is situated far above the ground so actually you need to large stair to get a better look at the rudder and vertical fin. And therefore, I introduced the virtual stair and with that tool I manage to see a little more of the vertical fin section. It turns out that the developers had great eyes for many tiny details. And, is it a worthy Albatross? I can tell you, it’s worth a 200 percent! The movies I’ve seen on YouTube are mostly privately owned Albatross HU-16 models. That said, color schemes are unique and therefore not included in the package. 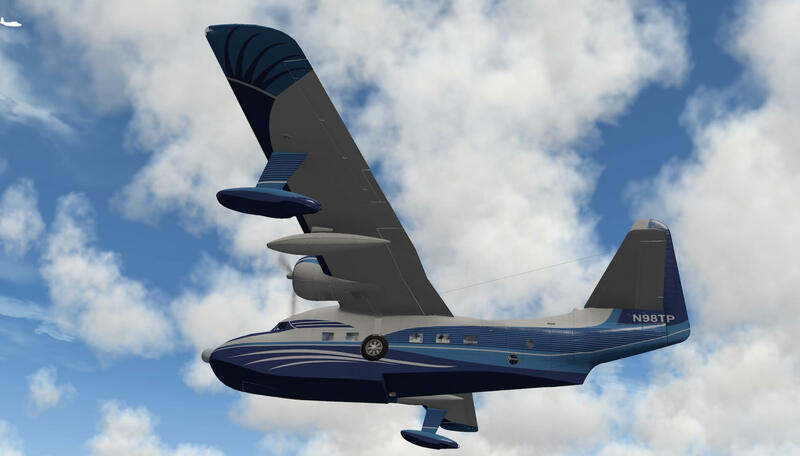 While writing this, I immediately checked X-Plane.Org for additional liveries, but it turned out I couldn’t find anything. Just to be sure, I also checked the contents of the Khamsin Hu-16, but the four liveries are all real liveries. But there’s good news, Khamsin published a paint kit for the HU-16. Check out this link. It may look like that I have some issues, but believe me, I really like this Khamsin/Hydroz Albatross. A little more weathered look for the aircraft and a few more oil drips on the engine cowling would be in my humble opinion welcome, but overall the 3D model looks great, as well as the four liveries. It turns out that I’m a little too late for the cockpit crew which is of course my own. I didn’t want to listen to the ground staff and therefore my external check took more time then planned. I take my seat which is the right hand observer’s seat, being on this test flight as observer. I think that’s a good idea since it gives me enough time to check out the modeled 3D cockpit since this wasn’t really planned. While the pilots take care of the necessary preparations, checks and what else has to be done, I look around and I’m overwhelmed by the overall quality. While the pilots are ready with their cockpit preparations and checks, they start the engines with the help of the on-screen checklist. After the engines are started and stabilized at idle for at least 5 minutes, the pilots double checked once more if all items on the checklist were covered. Then, the Pilot Flying (PF) starts the taxi to the beginning of the runway 10. It seems that taxing the Albatross is easy, but I was informed by one of the pilots that something feels not 100 percent and that is this. You need to taxi with a slow speed and then you can correctly control turns, which is not strange since it’s also applicable to other X-Plane aircraft. But when you brake suddenly, the nose of the aircraft reacts too much, in my humble opinion. It goes up and down and OK, the tail won’t hit the ground, but it looks to me a little weird. I noticed by the way, that you can select EASY TAXI ON or OFF, more about this option later, but the moment I select EASY TAXI OFF, it seems that I can’t taxi at all. Perhaps I am doing something wrong or it’s a known issue and will be solved with the next patch or Service Pack. I mentioned this already before, that the pilots used the virtual on-screen checklist, so let’s dig into it and see what else is included in this Khamsin popup menu. 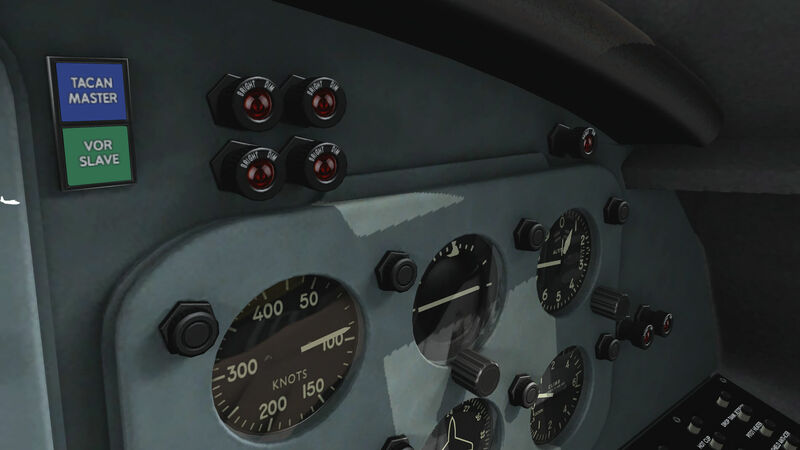 Main menu overview, Aircraft Health, Views, Checklist and copilot commands. Ok, each of them needs some additional explanation. 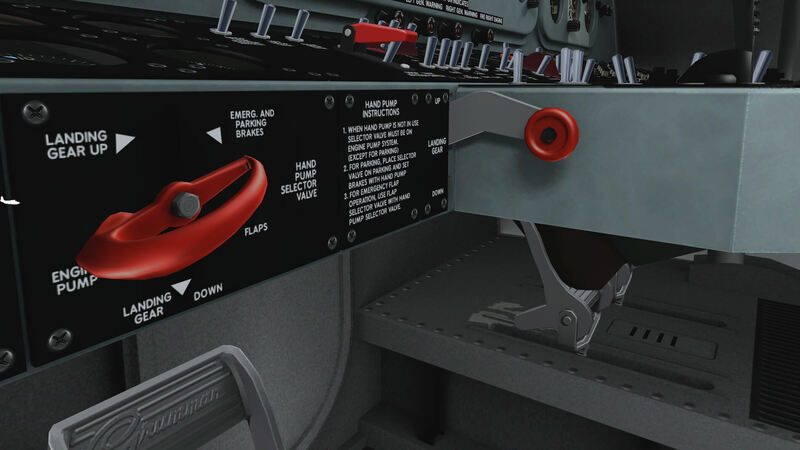 The Easy Settings sub-menu allows you the handle the engines, hydraulic system, fuel system, taxi and water operations in the easy way or in the real way. The real way of course makes it harder to control/fly and therefore more skills are needed. The Co-pilot Settings allows you to select who’s controlling the engines, at least that’s the way it looks to me. By default (selection ON) the co-pilot is taking care of the engines. 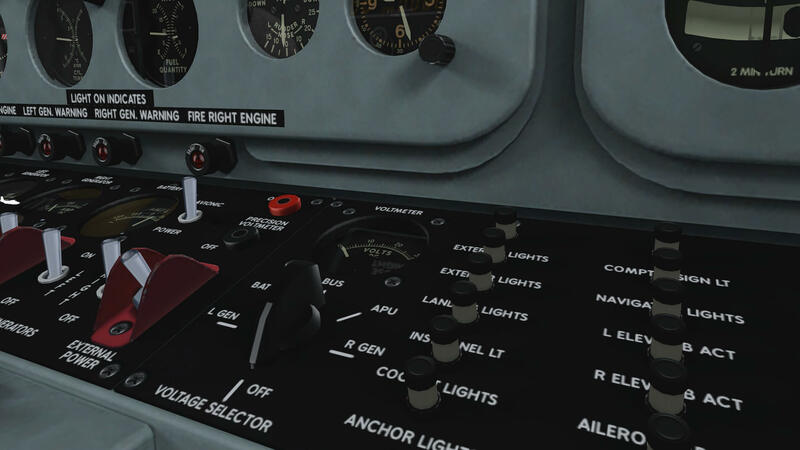 When you select this option to OFF, a message on your screen tells you that “Captain, you have the engines” so the captain now also has the engine controls besides flying the aircraft. Further on, if you want the co-pilot to gives you the necessary notifications, as in real life too, then you can choose between the options ON or OFF. The Sound Settings are by default set to 100 percent level. You’re able to increase or decrease this value between 0 and 100. 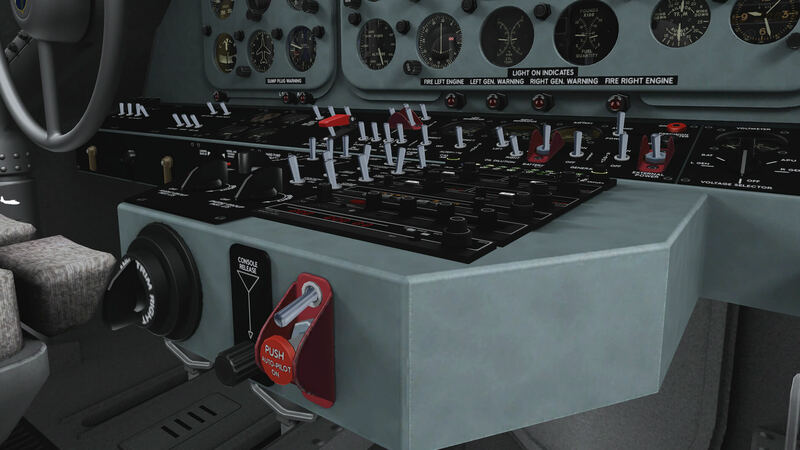 The Pilot’s Seat Settings allows you to hide or to show the flight yokes. When you select this to OFF, not only the captain’s yoke disappears, but also at the co-pilot’s side yoke. The Aircraft Health gives you a summary of certain aircraft systems and their “maintenance” status. It also gives you the “used total hours” which is basically the hours you’ve been running X-Plane with the aircraft loaded. When the “health” is becoming too low, you’re always able to fix the systems with one simple click. When it comes to the virtual on-screen checklist, you have many options. You can do it manually or you go for the Co-Pilot Command menu option. 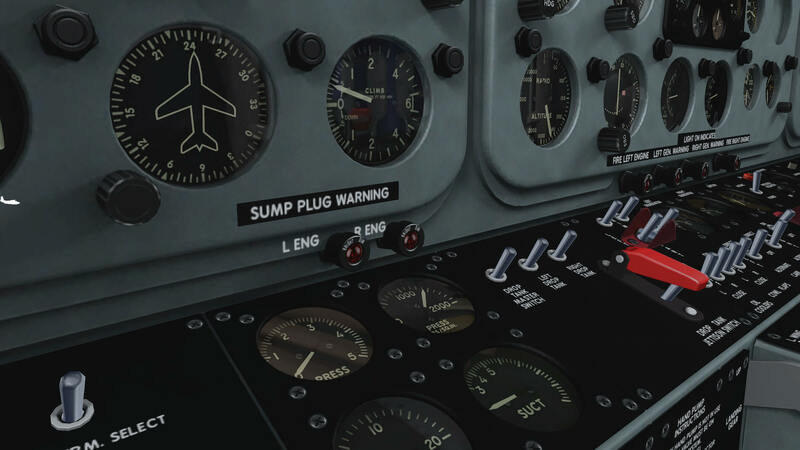 Here you can select which checklist has to be done by your virtual co-pilot. In a separate window you can see the progress of the checklist items. 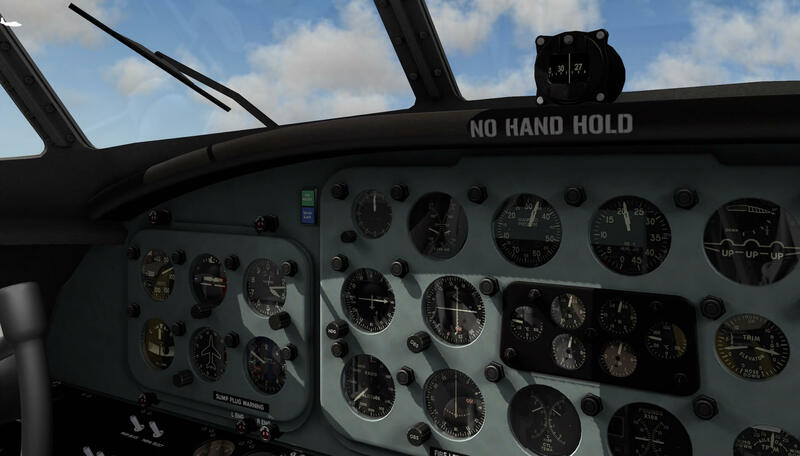 The virtual co-pilot checklist consists of Pre-Start, Start, Pre-Taxi, Run-Up, Pre-Takeoff, Takeoff and Post Takeoff, Approach, Landing (for landing on land) and Post Landing, Landing (for landing on sea) and Post Landing and finally Ground Secure. If you want to abort this automatic checklist action, you can always do so. 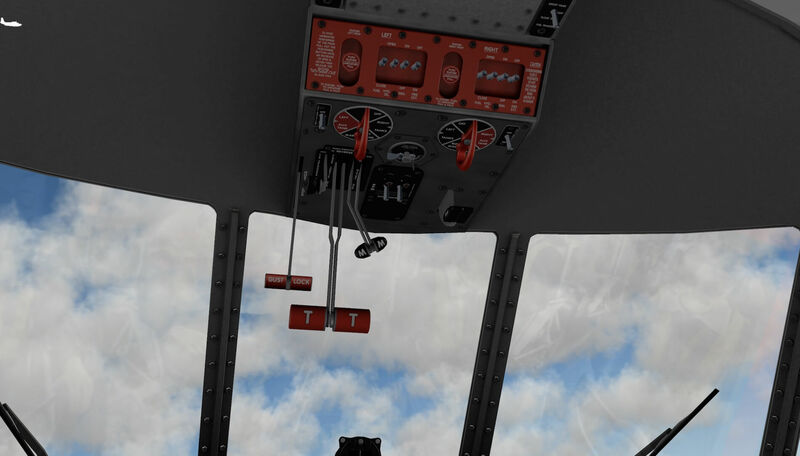 The Weight and Balance popup window allows you to increase or decrease the amount of fuel in the wings. Each wing contains three fuel tanks and each tank quantity can be changed with the help of your mouse. Although the Khamsin Albatross manual comes with a checklist, there’s not really a need to print it out. Of course, you can, but this Checklist menu option offers you a virtual on-screen checklist booklet with all the actions to perform. As far as I could see, when you’ve taken an action, the checklist won’t show you a tick or something else to confirm that you’ve performed that action. And finally, there’s the Views menu option. I think this menu item will speak for itself. 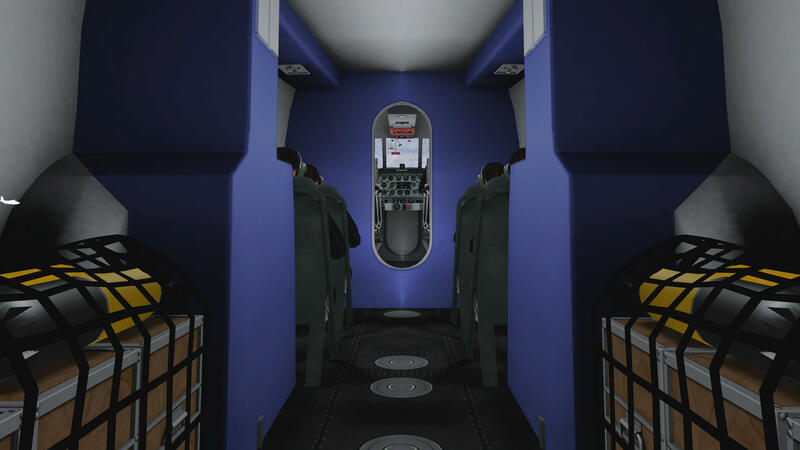 Worth noting; the available views are only applicable to the interior of the Albatross thus it only offers you different cockpit views and one cabin view. During our taxi, I noticed the “pilots reflection” effect in the front windshield panels. Although it is fake, it looks nice, but above all realistic. I’m surprised how clean and without dents, scratches or weathered look the main instrument panel looks. Is it real or not? 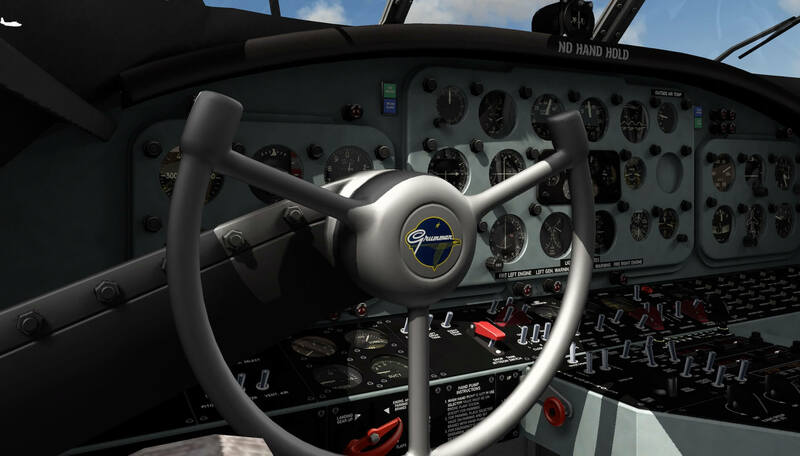 That depends upon what you want to see, but I can tell you that in all the Albatross Hu-16 YouTube movies I’ve seen, they all have a brand new instrument panel; at least a panel without scratches, dents or a weathered look. Not strange since I highlighted this already before, most of the Hu-16’s in those movies are privately owned aircraft and when you own such a beautiful aircraft, you try to keep it as new, including the cockpit and even the outside. 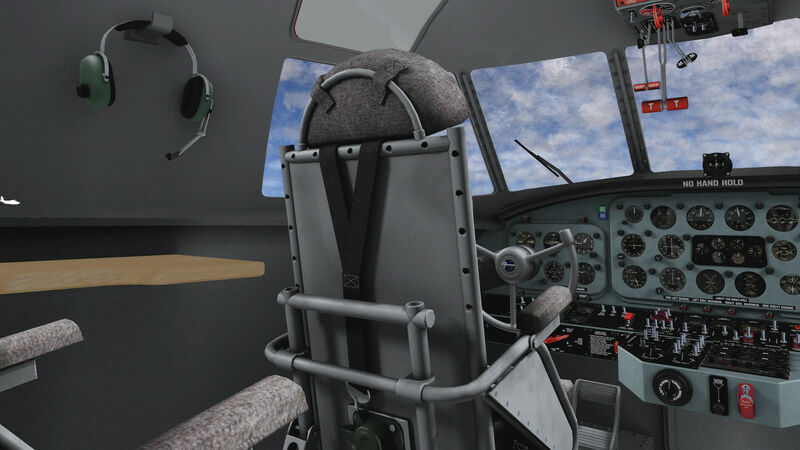 Anyway, during my second thorough 3D cockpit look, I must conclude that the 3D cockpit is very well modeled and that means not only the main instrument panel, but also the overhead panel and pedestal. Furthermore, the sidewalls and ceilings are beautiful too, and almost forgotten, the pilot’s and observer’s seats. 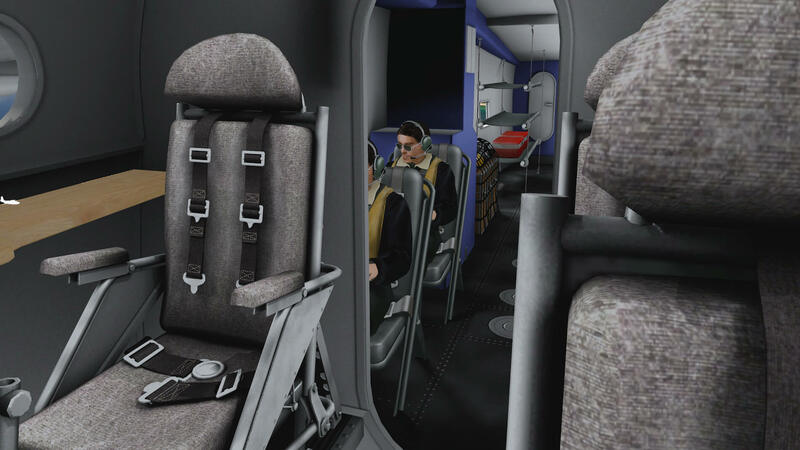 Although you probably won’t check every seat detail during flight, it is worthwhile to check them out and you’ll be surprised at the overall seat quality. As an observer on this flight, I have enough time to check almost every seat rivet, screw, cushion, belts, construction and whatever else is there. Ok, back to the main instrument panel including the flat switching panel and, linked to this, the pedestal. 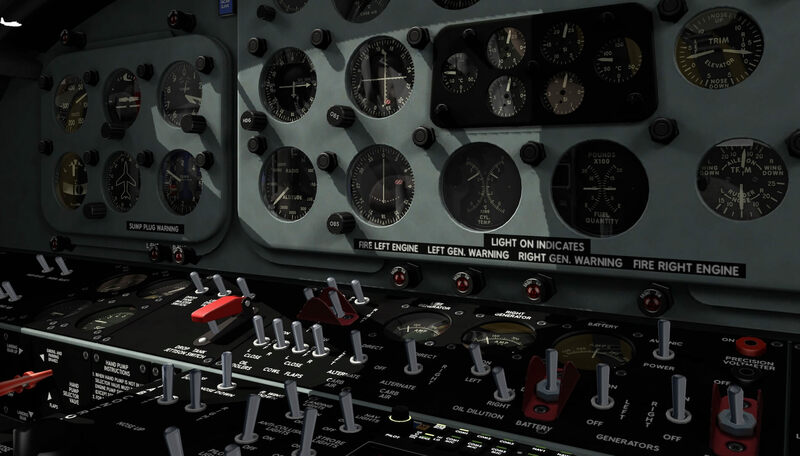 From the pilot’s seat distance, the switches, lights, knobs, indicators and handles, it all looks so real and it seems nothing is forgotten. But what happens when you zoom-in on each panel section? Then you don’t believe you eyes. 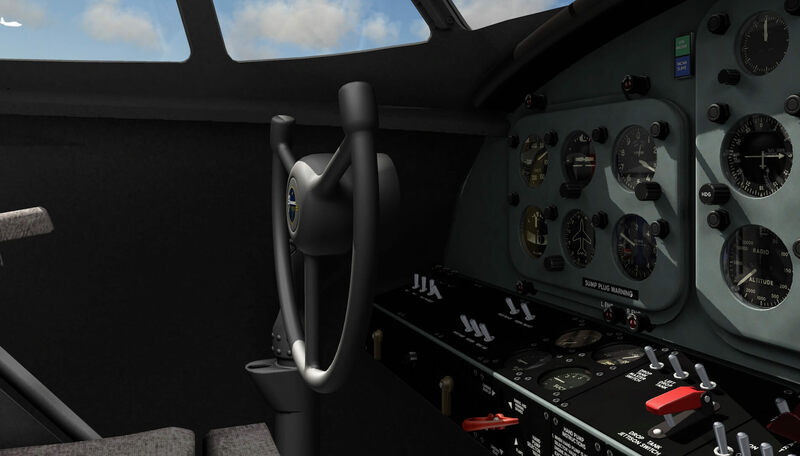 I’ve seen many good and well modeled 3D cockpits, but this is one of those that comes with an extreme high quality. Each indicator stays razor sharp when you zoom in, but it’s not only that it’s razor sharp, it’s also the glass reflection of the indicator that makes it unique or the quality of the needles. Normally you would say that when you zoom in too much, you’ll notice the presence of the polygons, but for some reason, even close to the indicator, I still can’t see the number of polygons used and thus the lines that form the round indicator. In other words, indicators stay round, and so simple is that! How they did it, no idea, but the result is great. But there’s so much more to see and honestly, I don’t know where to look first. 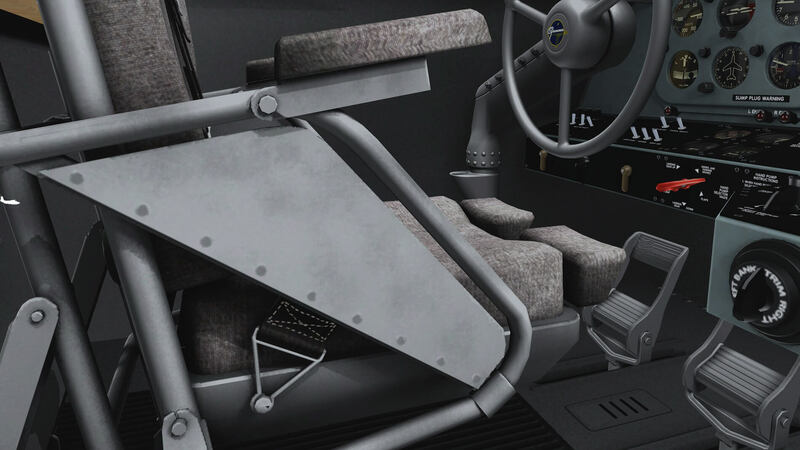 I mentioned already the highly detailed seats, but what about the rudder and brake pedals? Although you probably never look that close to these, give it a minute to check them out. So detailed! But there’s no wear on the pedals, which would be a good idea to have. Pedals never stay new, even it’s a privately owned aircraft. I mentioned earlier the overall quality of the main instrument panel, but forgot to highlight the switching panel with pedestal and circuit breaker panel. It’s impressive to see how sharp the text on the panels is and this also applies to the round red annunciators. On each annunciator is written in tiny text BRT and DIM. Unbelievable how they did it! By the way, the circuit breakers panel looks nice, but as far as I’ve seen, no circuit breakers are functional. Good, just before takeoff I had a look to the overhead panel, although the panel isn’t as big as you find in medium or large commercial jets. But there’s more. All aircraft I have seen from Khamsin, always have detailed virtual cabins. The same with this Albatross Hu-16. 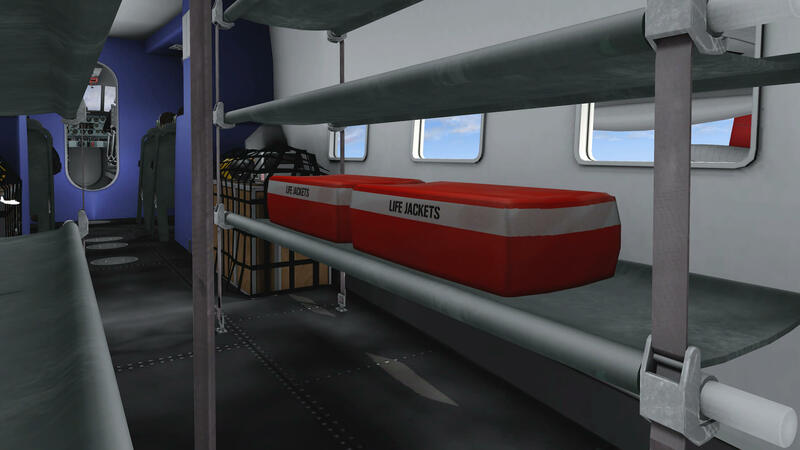 It’s modeled with great detail and worth having a look in the cabin during one of your flights. I watch how the pilots do their final checks before we make our takeoff. It seems that the Albatross climbs slowly, but steadily we reach 4000 feet. 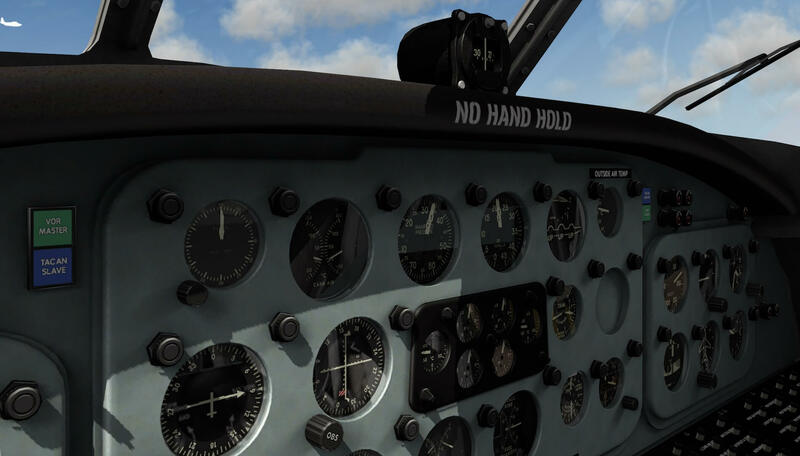 Although the Albatross is equipped with a basic or limited function Auto Pilot the pilots connect it for a while, but according to them it’s much more fun to fly the Albatross by hand. Trimming the pitch and roll is then of course needed, but doesn’t cause complicated situations. There’s only one thing I noticed, that the modeled Albatross needs a constant trim correction on the roll channel. Pitch works OK, but I’ve got the feeling that a trimmed roll isn’t so trimmed as you think. That said, with a trimmed pitch, the Albatross follows that pitch for a longer time, and thus no constant pitch trim is needed. That’s difficult to say. A trimmed aircraft stays on that trimmed and intended flight path as long as there is, for example, no external influence on the aircraft like wind or clouds in the surrounding area. Anyway, trimming the Albatross and thus flying the aircraft by hand is fun, realistic and keeps you awake. 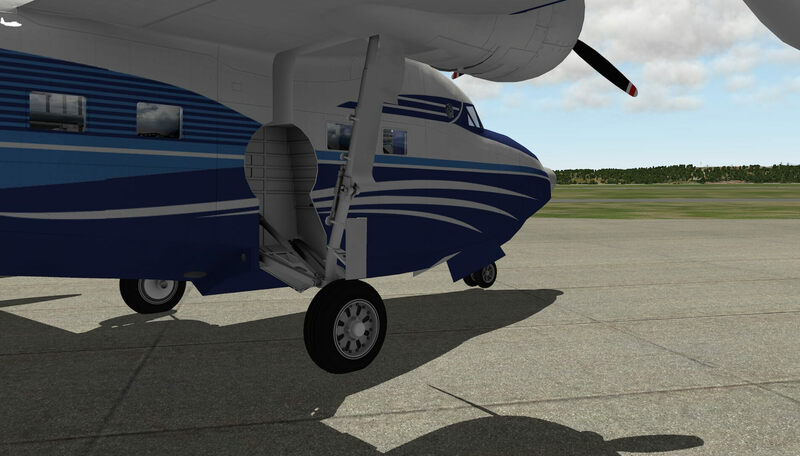 While we’re flying further away from Red Wing Regional Airport in a northern direction towards Lake Minnetonka, there should be also a moment to test the Albatross during a water landing. Lake Minnetonka below us is the right choice. I get the chance to fly the aircraft by myself and try to touch the water for a moment and then finally I’m able to make a full touch and go. A touch and go because there’s nothing around here and we don’t want to end up somewhere in the wilderness. As said before, I fly the Albatross by hand, so with no Auto Pilot connected and it feels OK. If think it flies ‘as real as it gets’ although that’s something I can’t judge, even after I’ve checked several YouTube movies. 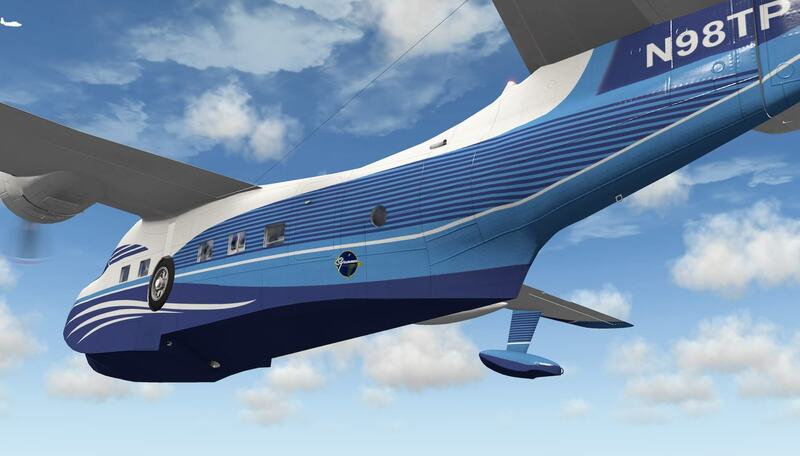 Looking at the Albatross aircraft shape, it is for sure not a Speedy Gonzales aircraft model, and therefore it behaves slowly but gently through the air. I gently descend and although it looks easy to touch the water, I can tell you that this isn’t as easy as you think. Trying to fly a couple of meters or feet above the water without touching the water seems a difficult task. It has nothing to do with the Albatross. When touching the water, I’m shocked at the noise which is the result of hitting the water, but shocked or not, the Albatross fuselage bottom skin has no problems with it. With the flaps fully extended, I tried to lower the landing speed, but slow or not, water offers a hard impact. While reducing the throttles, the Albatross sinks more and more in the water and before I know it, it’s no longer an aircraft, but a boat. I can tell you that trying to make a water landing, either a touch and go or with a full stop, is fun. A lot of fun! As with everything in life, fun ends and finally we have to return to Red Wing Regional Airport. I stay at the controls and try out a couple of things in the cockpit, one of which is testing the Auto Pilot. We slowly reach our final destination and from an altitude of 1000 feet, I slowly, but gentle as usual, descend the Albatross and pinpoint my location near one of the ships. Once I touch the water, it is easy to move forward, but making a turn is quite difficult. I finally end up near the beach and then, all of a sudden, the landing gear is selected down which I didn’t do. Strange! I didn’t highlight this before, but the “active” virtual co-pilot helps you with a lot of things. One example is the throttle settings. When you retard the throttles, the co-pilot will inform you via a text message that your throttle setting is at cruise power or whatever is applicable, but when I retard the throttles to idle, I don’t see the co-pilot telling me that I’m at idle power. I said this already a couple of times before, that I had a lot of fun and enjoyed every minute using this Khamsin/HydroZ Albatross aircraft. 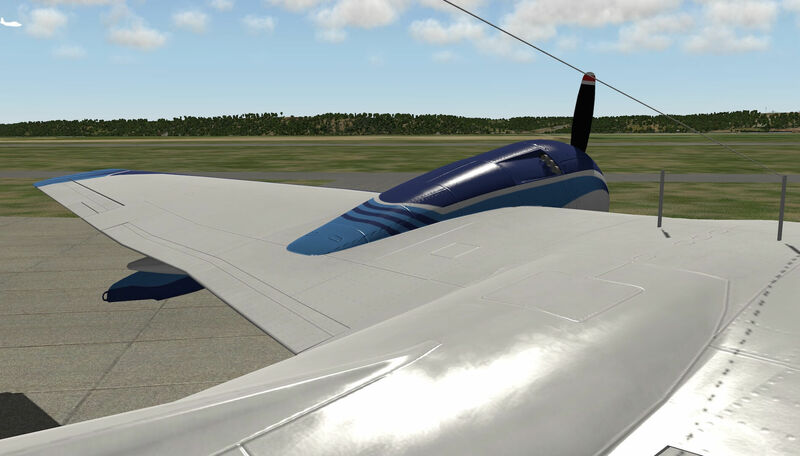 As per today, January 31st 2016, I decided to republish and recheck the Albatross with X-Plane 10.51. I didn’t test the aircraft with X-Plane 11 pb9 since I’ve got no contact with Khamsin and therefore no idea if the aircraft flies well. The latter is a very realistic representation of a weathered version of the IT Albatros. Salt water and sun took a toll on the nice paint schema. The screenshots below offer you a collection of the weathered version and the clean version. Check out these Italian SAR liveries via this link. By the way …. did you like the N98TP livery for the Albatross? 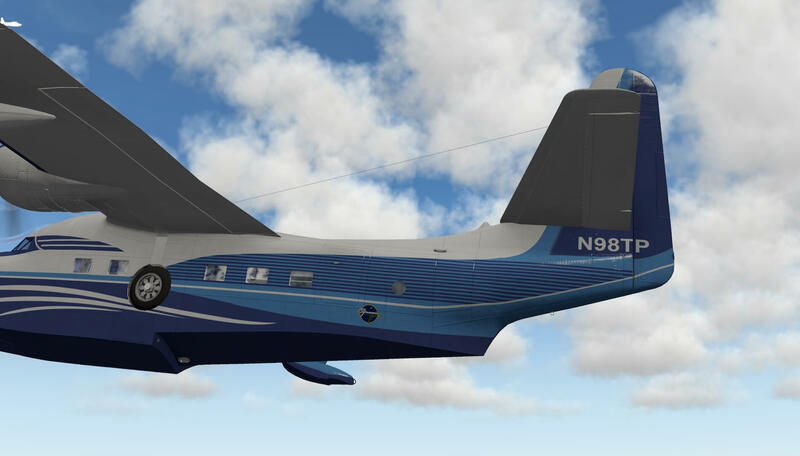 This livery is on special request painted by Marc Leydecker aka Belga12345, you know, the Marc from his airports and many other X-Plane activities. 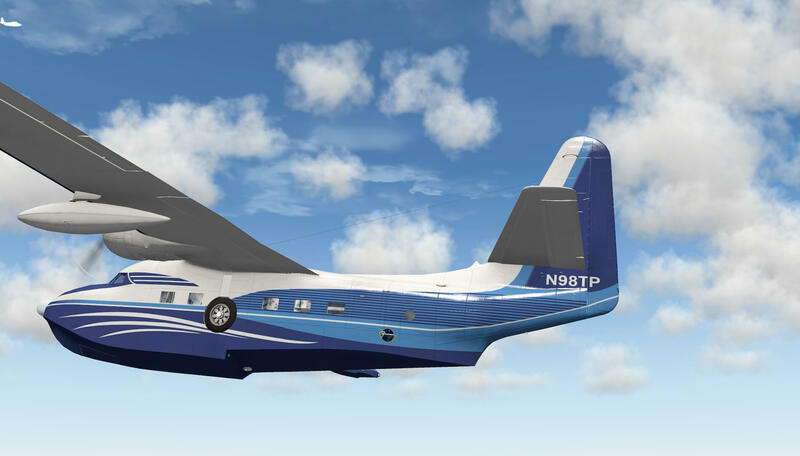 You can grab this livery for free, but only as registered member via this Belga12345 N98TP link. 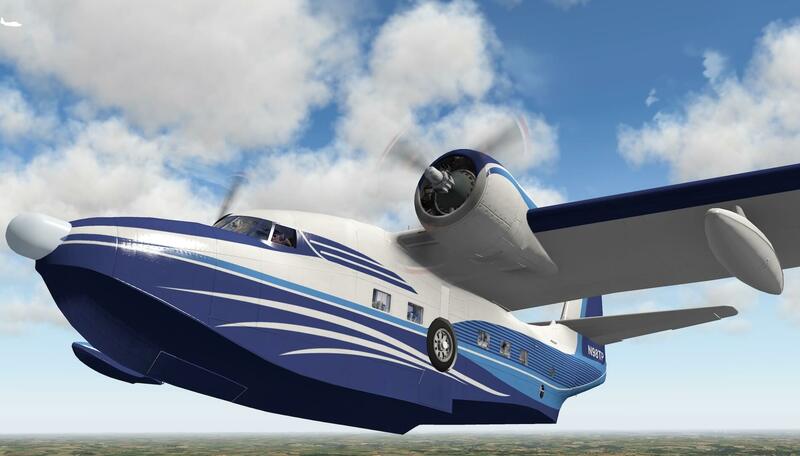 More information of the Khamsin/HydroZ Albatross can be found on the dedicated Khamsin web page. 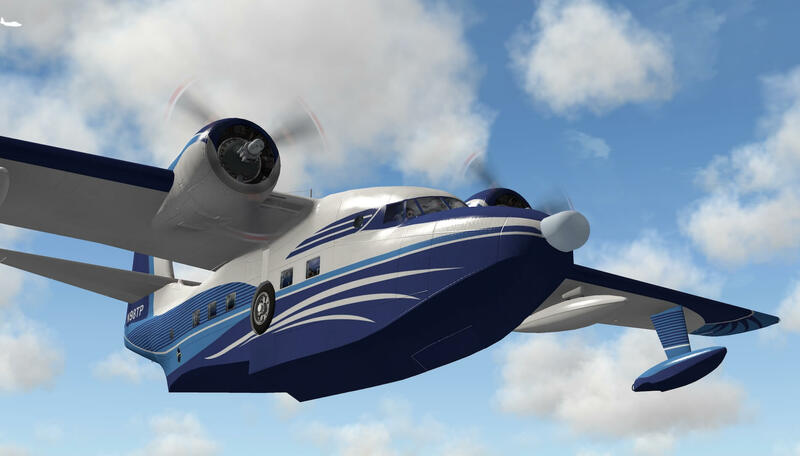 When you’ve become just as enthusiastic as I am, I suggest that you then visit the dedicated Grumman Albatross Hu-16 X-Plane.Org web page. At the time of writing, the Albatross will cost you 29.95 USD. 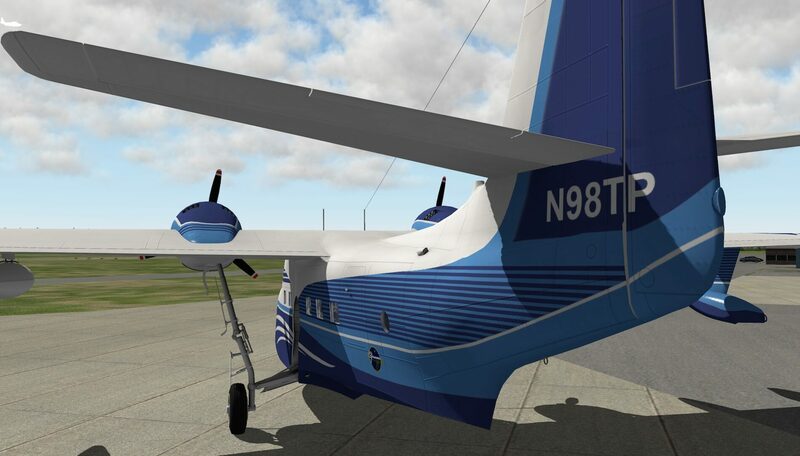 This has been another comprehensive review of a well modeled X-Plane 10 aircraft. As happens with many other of the reviews that I write, I’ve become enthusiastic about the way it is made. 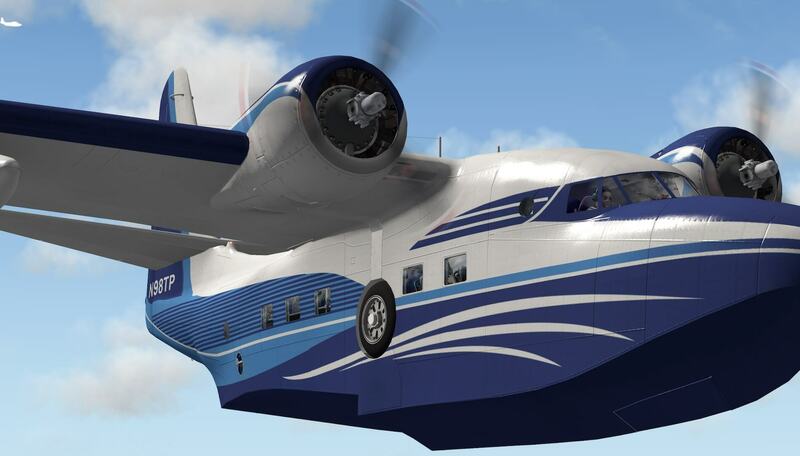 And yes, I think that a couple of things I’ve seen on the movies aren’t modeled on and in the aircraft, but overall a worthy high quality modeled X-Plane 10 historical aircraft! Feel free to contact me if you’ve got additional questions related to this review. You can reach me via email Angelique.van.Campen@gmail.com or to Angelique@X-Plained.com.